Yesterday I had misgivings about my child checking out library books, as I often do. It’s not because I don’t want her to—of course not!—but because she always already has her 30-book limit met and then she has to use space on my card or her dad’s. We don’t mind, but it makes for some confusing renewal issues. Of course, I let her use my card—what else are you gonna do?—and she chose some really fun books. One of the books is about female inventors. 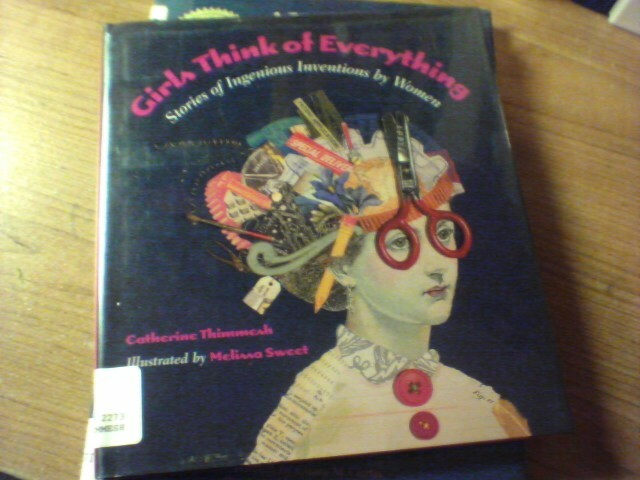 It’s called Girls Think of Everything: Stories of Ingenious Inventions by Women. I know that sounds a little sexist—do girls really think of everything without boys, after all?—but when you think about it, nearly all of our history is presented from a “boys think of everything” mentality, and our kids rarely ever hear about anything invented by a woman. In fact, the only female inventor that I can even think of is Marie Curie. So, this book will be enlightening for both of us. Browsing through it, I have to admit I was hoping for some real photos of these women rather than the caricature drawings within it. Still, it’s got some very interesting information, and while it’s pretty wordy, it’s still interesting, not the dry factual information you might expect. For example, did you know that the Apgar Score was invented by a woman doctor? The first ice cream cone was invented by a woman, so legend goes—and some of the first inventions by women were patented in their husbands’ names since it was illegal or simply more difficult for women to obtain patents. So there could be many other inventions that we don’t know about that were made by women, too. Some very popular inventions created by women include chocolate chip cookies, windshield wipers, Kevlar, liquid paper, and Scotchguard. Reading through the stories, you’ll find that some finds were purely accidental—while others were methodically tried and tested in order to solve a particular problem or fill a need. Children—both boys and girls—will enjoy these fun stories and perhaps even come away from the story feeling as if they, too, could create something new and useful for our society. An eleven year old girl was the inventor of the no-spill feeding bowl, after all, that many parents rely on when traveling or feeding toddlers.